80-year-old Donald Martin had a property line dispute with his neighbors in Rochester, PA (Beaver County). 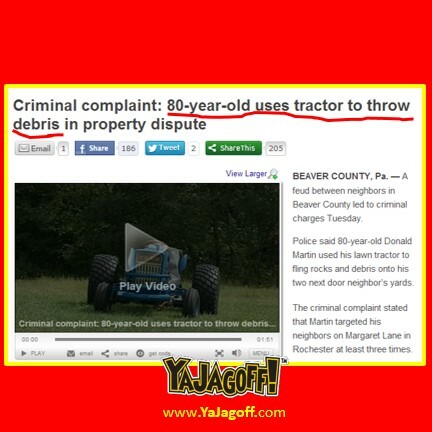 So he did what ANY neighbor would have done to rectify the problem…he hopped on his tractor and used it to sling large rocks and tree limbs at his neighbors!! Who needs a magistrate anyway? At some point, the Rochester police were called and Spunky Don ends up with criminal complaints against him for doing this THREE TIMES. According to the WPXI story, the police almost had to use a stun gun on Spunky Don. WHAT IN THEEEEEE HELL WAS IN HIS RAISIN BRAN???? Ok..tht’s a lie too but its mildly more entertaining and just as immature as what REALLY happened. Hey Spunky Don, we have one SIMPLE question for you. This has been going on since June! Do ya think you might have cut all of this nonsense off-at-the-pass by using the tractor to drive over to Mr. Locke’s house with an apple pie (even if it was store bought), giving Mr. Locke a friendly little tap on the shoulder and asked him to bring out some al a mode ice cream then sit down and chat this up, Ya Jagoff?? Next articleI Do WHAT When I Hear A Siren? So Is This The “Peter Parker Authority” Now?